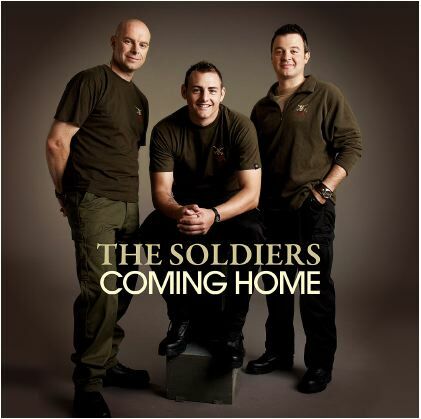 Last year three soldiers by the names of Sergeant Major Gary Chilton, Sergeant Richie Maddocks and Lance Corporal Ryan Idzi joined together to form a singing trio called, appropriately enough - The Soldiers. Christmas 2009 saw the release of their first Album, “Coming Home” with donations being given to three charities: Army Benevolent Fund, Help for Heroes and The Royal British Legion. Whilst listening to the album I found myself torn between the spirit in which it was made and the resulting collection. It is undeniable that the intention is good, the idea is touching and the sentiment is impossible to fault. Musically, the three men have very good natural voices and they perform well together, a nice change when compared with many other artists in the charts. However, most, if not all of the song choices on the album seem obvious and cliché: Lean On Me, I'll Stand By You and Against All Odds just to name a few. All are slightly reminiscent of the sort of thing you might find on the debut album of an X-factor winner - interestingly Idzi was kicked out of X-factor in 2007 after forgetting the words in the second round! Unfortunately, the song choices are not the boys' only problem with this album. The lack of a significant vocal lead leaves it slightly weak and lacking depth, which, in my layman's opinion, is the opposite of what they should be doing. As an easy listening, background sort of album I would say yes, buy it - stick it next to Susan Boyle's CD, under your Princess Diana poster and enjoy. On merit though, as an album, sadly it just doesn't cut it and as far as the charity side is concerned, I would suggest the Heroes DVD instead; a similar price with a massively higher proportion of the proceeds going to charity. together in the immensely popular flexiback jumbo format.  Biggles Second Case Biggles hunts for a wartime German submarine, the U-517, whose ruthless captain, Von Shonbeck, has escaped to the Antarctic with a horde of stolen gold bullion. down a ship frozen in the pack ice with a hold full of treasure and does battle with a gang of desperate villains while attempting to recover the ship's cargo.  Biggles Gets His Men Biggles is tasked with the dangerous mission of finding and rescuing a group of important scientists who have been kidnapped and smuggled to a remote region of China.  Biggles Follows On Biggles comes up against his arch enemy, Erich Von Stalhein, and teams up with Gimlet King's special forces unit behind enemy lines in China. Captain W.E. Johns wrote scores of thrilling aviation yarns that were avidly devoured by Biggles fans young and old from the time they first appeared in the 1930's right up to Johns' death in 1968 and beyond. A wartime RAF pilot, Johns' expert knowledge and combat experience added a rare dimension of authenticity to his novels, making these action packed adventures all the more exciting! BATTLE OF BRITAIN – SCRAMBLE! Achtung!, Schweinhund! For generations of men whose obsession with the Second World War and all military history was triggered by reading war comics in their youth, comes the first ever Commando's ultimate collection of Battle of Britain stories. Everyone who has ever turned a page of a Commando war library has a favourite story that stands out above the others for some reason of another. The first thing to catch the attention are the names… Spitfire, Hurricane, Typhoon, Tempest, Whirlwind, Mosquito. Who wouldn't want to read a story with aircraft like that twisting an turning through the pages, machine guns or cannon flaming, rockets ricocheting in every direction? Commando: The Battle of Britain – Scramble ! showcases the best of the best and it's 25 per cent larger so the older guys can read the comics without their glasses! Chosen by the former and current editor of Commando, the brilliantly drawn stories in this classic collection range from ‘Ace Without Honour', ‘Island of Heroes', ‘Brigand Squadron' as well as ‘Blind Courage', ‘Fly Fast-Shoot Fast' or ‘Spitfire Spirit' that bring the atmosphere of the battle spinning into the 21st century. Whether you are a novice ‘sprog' comic book pilot or a seasoned veteran, the fantastic aero art created by the Commando artists and the compelling stories will leave you gasping for the next ‘SCRAMBLE'! Calum Laird is the current Editor of Commando, having been appointed on George's retirement.